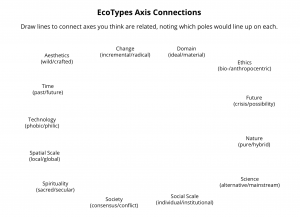 A good way to start thinking about Big Patterns connecting the thirteen EcoTypes axes from 2017-18 is by sketching the connections you feel may be possible. Based on your own experiences and discussions, which of these axes connect? Draw lines showing these connections, and label the lines to suggest which axis poles would line up via each connection. If you can, compare your result with those of fellow classmates. When done, feel free to read up on the 2017-18 EcoTypes empirical analysis, including correlations, network visualization, and factor analysis resulting in three proposed Big Pattern themes.